As part of my experience with the excellent and highly recommended Wilderness Travel Course from the Sierra Club I was able to experience snow shoe travel and snow camping. I had never really thought to participate in either of these activities before, but in my quest to expand my photographic horizons it has been really eye opening to learn how to safely travel in the wilderness and in wintertime and I look forward to using these skills to take photos in new and interesting locations all year round. Theo following series of photographs were taken on the snow travel and snow camp trips with the WTC. First up is snow shoeing on Mt. Pinos. 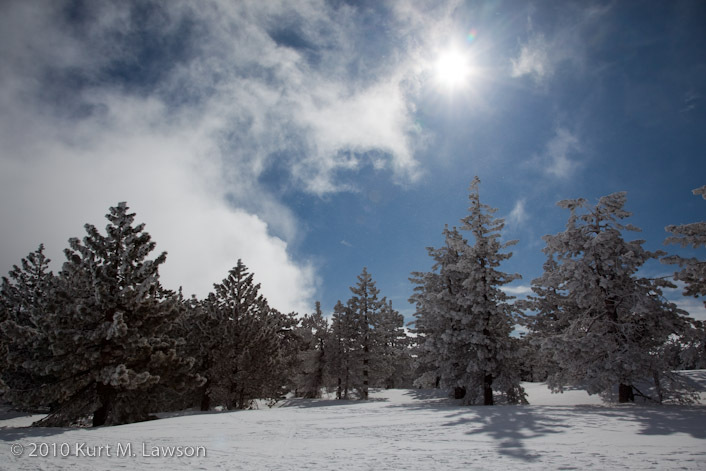 Our journey began with overcast conditions and snow, but on our way to the summit we experienced a very brief clearing in the clouds, snow and fog to reveal a beautiful blue sky from 8400 feet. Ski, hiking and now show tracks abound on this popular peak. I have visited this mountain numerous times in the summer and to see it like this was really a profound transformation. It was absolutely beautiful. 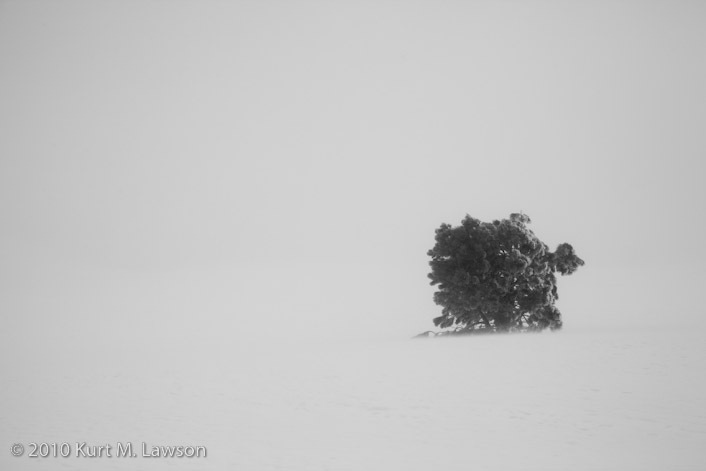 A lone tree became silhouetted against a sea of white as the snow picked up and the clouds skirted across the top of the mountain. We flirted with whiteout conditions on and off for the whole trip. Here the snow was coming down pretty hard. And finally a shot of our crew traveling single file with snowshoes and trekking poles. On our way to our snow camp destination, we stopped at Lone Pine. I snapped a quick shot of Mount Whitney, the tallest peak in the lower 48 states. Whitney is about dead center of this picture and due to its distance from camera appears smaller than the closer Lone Pine Peak on the left. Perhaps with a little luck this summer I will have some pictures of Mt Whitney from far closer. A view from the southern end of our campground reveals a beautiful scene. The rest of these photos are from the area around our campground at Rock Creek Lake. The afternoon the weather would bring us on and off snow showers with constantly changing light patterns. It was a really beautiful winter landscape. 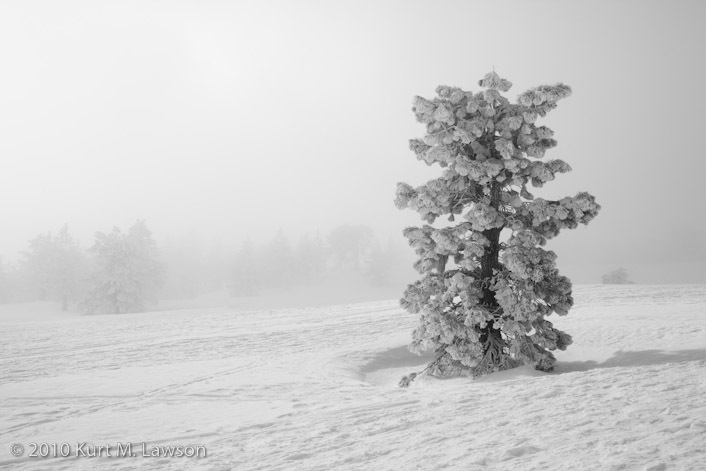 Marcia Lawson - Wonderful photos! Thanks for posting them! Emily Panning - Kurt, these pictures are beautiful. I especially love the ones with the snow and rocks together. You are so talented.